Because the objective in AFL football is so obvious, it is not often spoken about inside an AFL club. Yes, we are all trying to win the Premiership, and because only one team can win it, clubs can go generations without achieving their core objective. Even by comparison with other sporting competitions across the world, the AFL has the most singular ambition. There are no conference or divisional championships, no FA Cup if you miss out on winning the Premier League, no qualifying for Europe etc. Just one piece of silverware…the Premiership Cup, and they are rare and precious. The conversations inside an AFL club focus on one overarching question. Have we got the right system(s) in place to give ourselves the best chance of winning one, either now, or at some time in the nearish future? It is not a competition of teams; it’s a competition of systems. The Hawthorn Football Club has spent the best part of a decade winning because they’ve had the best system. Other clubs have sought to learn this system, appointing coaches and support staff who have an insight into this process. Since coach Alastair Clarkson’s Hawks won three in a row from 2013-2015, the last three Premierships have been won by clubs lead by coaches who spent significant periods in the Clarkson/Hawthorn system. The New England Patriots, led by coach Bill Belichick and quarterback Tom Brady have now won six Superbowls. Before this duo came together, the Patriots had never won a Superbowl. I have known Alastair Clarkson for many years, appointing him to his first coaching role way back in 1998 as Neale Daniher’s assistant/runner the year after Clarko retired as a player. He has many fine qualities as a coach, but if I was to name the one attribute that sets him apart, it would be his aptitude. He has a voracious appetite for learning, but also the courage to experiment, go with a hunch, ask better questions, try new things knowing that many will sit in judgement, and he will get things wrong from time-to-time. The result? 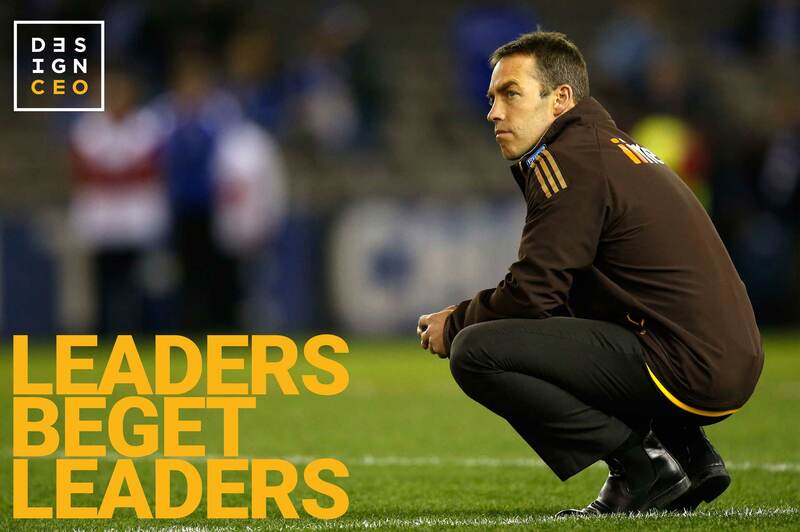 Alastair Clarkson is the most influential coaching voice of his generation. Like many in the sporting world, I have studied the Patriots from afar. They are not an easy club to get close to. They remain guarded, and why not? They seem to have the secret sauce, or more likely, the best systems. The Hawks and the Patriots have much in common. Both have had their share of controversies, but more than anything, they develop great systems that produce championship teams. Firstly, I believe the ‘goal’ is overrated. Yes, it will provide you with a focus, and that’s important, but it is your systems that’ll be the key to your success (or otherwise). And what is the most critical system? It is your talent system, starting with your leaders. It’s for this reason the designCEO facilitated programs and mentoring utilise performance frameworks and methodologies heavily influenced by elite sport, ensuring commitment and accountability to a team-based ethos. We teach a system that develops leadership, on the basis that leaders beget leaders. Take responsibility for their personal development in the context of the team/organisation. Understand that it not just what they bring to the team, it is what they are prepared to do for the team that counts.